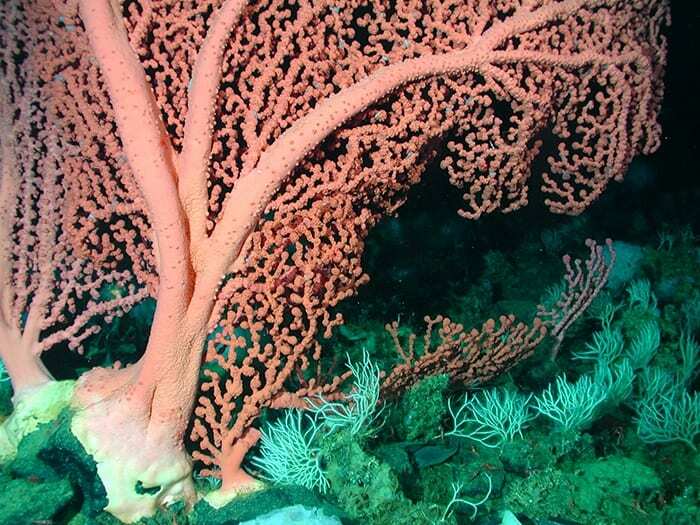 The ability of deep-sea corals to harbor a broad array of marine life, including commercially important fish species, make these habitat-forming organisms of immediate interest to conservationists, managers, and scientists. Understanding and protecting corals requires knowledge of the historical processes that have shaped their biodiversity and biogeography. While little is known about these processes, new research described in the journal Molecular Ecology helps elucidate the historical patterns of deep-sea coral migration and gene flow, coincident with oceanic circulation patterns and events. The investigators propose a scenario that could explain the observed evolutionary and present-day patterns in certain coral species. The findings can help scientists determine how climate change and other global processes have affected ocean habitats in the past and how they might do so in the future. “The information generated in this study provides critical baseline data with which the potential effects of disturbances, such as global warming and ocean acidification, on populations inhabiting earth’s largest biome can be assessed,” says first author Santiago Herrera, a PhD candidate at the Massachusetts Institute of Technology and the Woods Hole Oceanographic Institution (WHOI). The research will also provide new opportunities to examine ancient migration patterns of other marine organisms. Herrera and his colleagues have been investigating ancient deep-water coral migration patterns from various seamounts—geological features that rise at 1,000 meters or more from the seafloor and often form long chains—and other hard-bottom habitats such as canyons, fjords, and continental slopes. The investigators’ analyses involve the utilization of museum specimens, some of which date back to the mid 19th century. This latest study focused on one species of coral: Paragorga arborea, also known as bubblegum coral. This coral has been found at polar, subpolar, and subtropical regions of all of the world’s oceans. Few studies have evaluated the overall genetic diversity of widespread deep-sea species, and researchers have wondered whether Paragorgia arborea is in fact a single species on a global scale or whether it has evolved into a set of ‘cryptic’ species, in which they exist as a set of genetically distinct species that are morphologically indistinguishable. “Analysis of eight gene regions from more than 100 individual corals, collected worldwide over the last 134 years, revealed evidence that individuals collected in regions separated by tens of thousands of kilometers at depths ranging from 100 to 1,500 meters belong to the same species,” says co-author Timothy Shank, an associate scientist at WHOI and Herrera’s mentor. “This genomic and sampling coverage represents an unprecedented effort towards solving fundamental evolutionary questions in deep-water corals,” he adds. Surprisingly, the researchers found that populations of Paragorgia arborea from the North Atlantic share a more recent historical connection with the southern hemisphere populations, rather than with the North Pacific populations, which are much closer geographically. This connection seems to have occurred during the late Miocene – early Pliocene period. Other researchers studying different marine organisms such as spiny dogfishes and bryozoans, also known as moss animals, have found this same historical genetic diversity pattern. Furthermore, the findings are consistent with the latest ocean circulation models for the epoch. These results from the deep sea stand in marked contrast with the hypothesis of a trans-Arctic interchange, which suggests a recent migratory connection between the North Pacific and North Atlantic based on the distribution of several shallow-water organisms such as red algae, sea stars, bivalves, gastropods, barnacles, and seagrass. 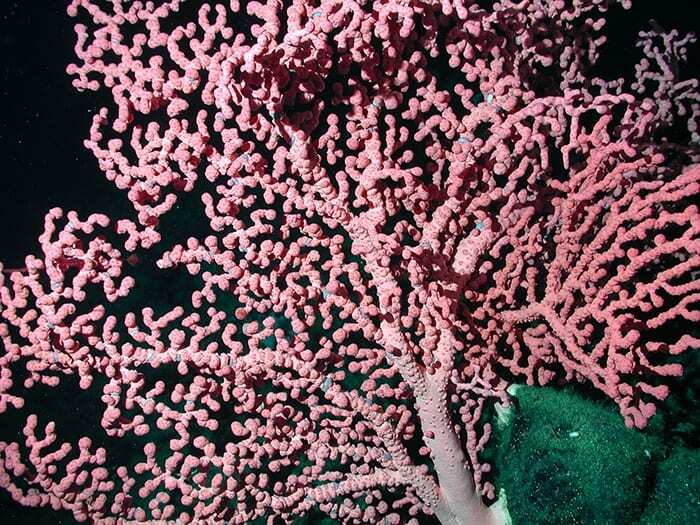 “There were many bubblegum coral specimens available from northern locations and very few from southern latitudes to test our hypotheses. So, nine years ago we started to search for specimens in the southern hemisphere, and thanks to our collaborators in New Zealand (NIWA) and Australia (CSIRO), we were able to gather a numerous collection of Paragorgia specimens from the south that allowed us to perform a robust global analysis,” says senior author Juan Sanchez, director of the marine molecular biology laboratory of the Universidad de los Andes, in Colombia. Moving forward, the scientists plan to expand their research. “The next steps from this study will be to test what small-scale environmental factors produce the differences we see in the genetic composition of neighboring populations—such as the Western and Eastern North Pacific populations—and to try to identify specific adaptations of populations of this species that live at the environmental extremes of its distribution, for example at very shallow and deep depths, and in conditions of relatively low and high pH,” says Herrera. They also plan to study whether the historical connectivity patterns seen in Paragorgia arborea are found in other deep-sea species, which will give them a better understanding of the origin of the biological diversity present deep within the oceans. “The observed genetic diversity patterns, and the inferred evolutionary history of origin and spread of Paragorgia arborea could explain the current distribution patterns of many other marine taxa, for example deep-sea coral symbionts, such as brittle stars and squat lobsters, and thus might have played an important role shaping existing deep-sea faunal diversity,” says Herrera. This research was based on work supported by the Global Census of Marine Life on Seamounts Project (CenSeam), the Facultad de Ciencias – Department of Biological Sciences of the Universidad de los Andes, the National Systematics Laboratory of NOAA’s National Marine Fisheries Service, the Smithsonian Institution, the Systematics Association, the Linnean Society of London, and the Sigma Xi Research Society. 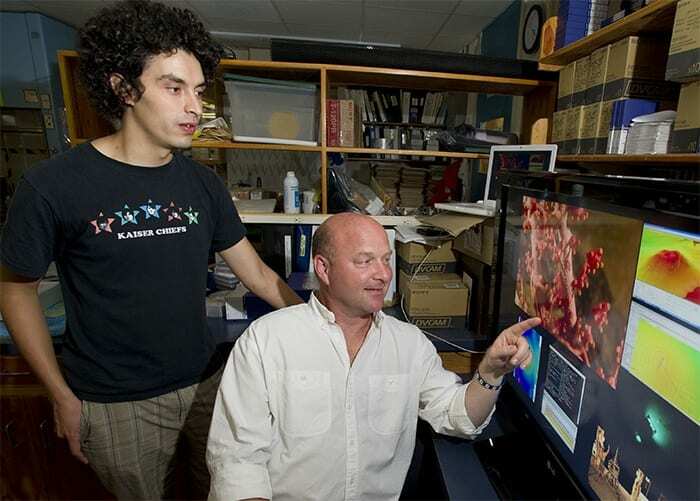 Santiago Herrera (left) and Timothy Shank (right) at WHOI have been investigating ancient deep-water coral migration patterns from various seamounts. This latest study focused on one species of coral: Paragorga arborea, also known as bubblegum coral. The bubblegum coral Paragorgia arborea plays an important ecological role generating microhabitats for numerous species; they are the structural analog of large trees in a rain forest.